Few woodland owners relish sharing their wood with grey squirrels, but native red squirrels are a different matter. Trees for Life has launched an appeal to raise £22,000 to ensure a better future for red squirrels in the Highlands of Scotland. The Reds Return appeal will enable the reintroduction of red squirrels in up to eight woodlands in the north-west Highlands, where new populations will be able to flourish, safe from competition and disease from grey squirrels. This will also help the natural expansion of the region’s pine forests, because reds inadvertently plant new trees by forgetting where they have buried their winter stores of nuts and seeds. It will allow more people to see red squirrels in the wild too. “Although one of our best-loved wild animals, red squirrels are sadly missing from suitable woodlands across the Highlands. They cannot reach these isolated havens on their own, because they avoid crossing large open spaces,” said Steve Micklewright, Trees for Life’s Chief Executive. Trees for Life knows the reds can be rescued. 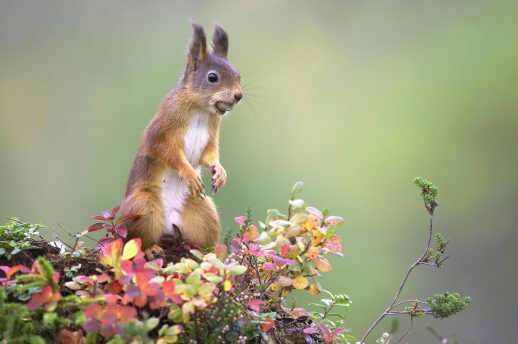 For the last three years, the conservation charity has been carefully transporting red squirrels from their strongholds in Inverness-shire and Moray to isolated fragments of suitable forest at Shieldaig in Wester Ross, the Coulin Estate near Kinlochewe, Plockton, Inverewe, the Reraig peninsular, Attadale and Letterewe. The hugely successful project has seen 140 red squirrels released so far. The animals have been seen exploring their new woodland homes, successfully breeding and spreading into new areas. Positive community involvement – including local people reporting sightings, monitoring the squirrels, and carrying out supplementary feeding – is at the heart of the project. The new red squirrel release sites have yet to be confirmed, but Trees for Life plans to focus on the Morvern peninsular and north of the Dornoch Firth, which will extend the species’ current range. Red squirrels are threatened by the spread of invasive grey squirrels from the south. Greys are immune to and spread squirrel pox virus, which is lethal to reds, and also outcompete the native reds. Greys were introduced to the UK in 1870 and now number over three million, compared to an estimated 120,000 reds in Scotland. This article in The Guardian attributes greys’ success to their natural inventiveness – successful problem-solving in the search for food ensures that greys thrive. Red squirrel numbers have also been decimated by the reduction of forests to isolated remnants. To support the appeal, visit www.treesforlife.org.uk/appeal or call 01309 691292.